4Seating is extending its Black Friday sale right into Cyber Monday, so that you can take advantage of some of the biggest deals in our company's history! This extraordinary sale is not to be missed: get 10% off any seat in our inventory, with over 100 styles to choose from. That's right--when you order $1,000 in seating, you will get $100 off of your purchase; a $2,000 order gets you $200 off, and so on. In order to take advantage of this discount, simply enter the promo code CYBER2015 into your order and then just sit back and wait for your chairs to be delivered. But that's not all, as there are two options to this unprecedented event! Besides the option of choosing 10% off, you can instead type in the promo code POWER2015 and receive free power recline on any of our power home theater seats. That's $100 off per seat--so $200 off for two seats, $300 off for three seats, etc. With over 70+ styles to choose from in name brands like Seatcraft, Barcalounger, and Lane, our power seats allow you to adjust to any desired position at the press of a button, and re-adjust your position at will. The technology is so efficient that the recline is both quiet and seamless, a smooth ride every time. This deal won't last long, so if you're interested in power seating, act now and save hundreds! The one exclusion to the above deals is Palliser home theater seating, but we've got a special sale for that brand! Simply type in the promo code GUARDIAN2014 to receive a free Guardian warranty on any purchase over $2000, or type in WHITEGLOVE2014 to enjoy free white glove delivery to your doorstep for any purchase over $2500. The Guardian extended warranty will protect your seat from stains, spills, rips, tears, glass breakage, and more, so you can rest assured that your seat is taken care of in the event of accident. White glove delivery will bring the chairs right through your door and installed directly in your home, so you don't have to lift a finger--just let the white glove team of professionals handle it and once again never have to worry. 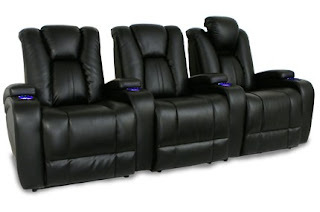 4seating offers the largest in-stock home theater seating to be found online in the entire country, with over 10,000 seats in our California and Texas warehouses. We carry popular name brands including Seatcraft, Lane, Barcalounger, Klaussner, and Palliser, in a wide array of design styles from classic to contemporary. This allows us to be able to provide 24-hour flash shipping on over 50 seat models across multiple brand names, and free shipping within the contiguous United States for all seats. Certain seats, such as those in the Seatcraft Majestic, Seatcraft Your Choice, and Palliser categories, can be custom-built according to your specifications in color, material, and features (these seats are not eligible for 24-hour shipping, as they are painstakingly crafted at our facilities to your needs). 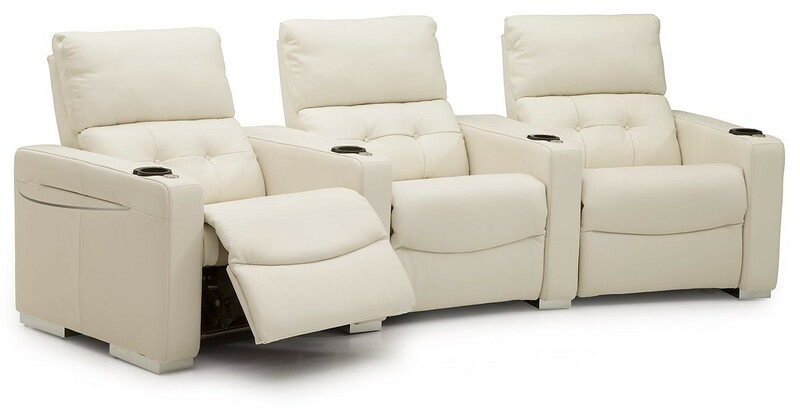 Features available in many of our seats include power recline, USB stations, adjustable headrests, lighted cup holders, ambient base lighting, included tray tables, in-arm storage and more--combining hi-tech efficiency with convenience and comfort in one whole package. 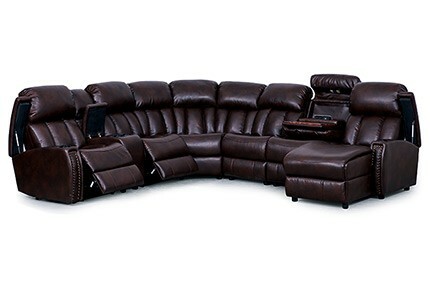 In addition, sofas and sectionals are available which can be configured into dozens of different configurations to suit your individual theater requirements. We also have one of the country's largest showrooms at our office in sunny La Habra, California, where one of our staff can personally assist you in selecting a home theater seat that defines durability and comfort. Besides our dazzling array of theater seating, please check out our expansive selection of home theater decor, including curtains, panels, accents, stages, poster frames and more! 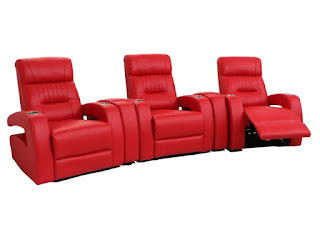 With so many exciting options, you can create your own complete home theater package through our site, or even get one of our team to assist you in the design.